It’s 2046 and utility is the watchword. In Emma Adams’ dystopian satire, the current rhetoric of strivers and scroungers has snowballed into a society in which each last member is judged on their usefulness. Fit, docile, unquestioning adults are in; the ill, the curious and the elderly are out. In this nightmare world of bubble-wrapped children and door-to-door euthanasia, lapped by the steadily rising tides of a planet out of control, Adams homes in on three resourceful older women. 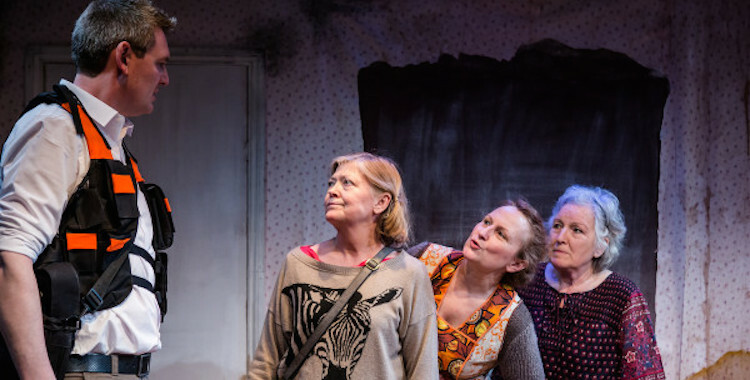 Tough, forbidding Norma (77 posing as 37), her ageing home help Joy and their drug-stashing neighbour Helen scratch out an existence through a mixture of cheerful blackmail and steely pragmatism, always taking what they can get. That includes Maya, the wide-eyed, over-protected girl who unwittingly disrupts the fragile peace of their lives. Teetering on the brink of adulthood, and with a father responsible for the “clearance” of those judged useless, she’s either the answer to their prayers or the catalyst of their destruction. As dystopias go, this is an intriguing one. Rather than being precipitated by violent upheaval or nuclear apocalypse, the crisis here is positioned as a brutal extension of austerity logic, going one better than cutting benefits by cutting the people dependent on them. This is a society with no room for the ageing or unproductive, spurring on a chilling Darwinian drive in its citizens. Terminate or be terminated. Trouble is, it’s too specific and yet not specific enough. Dystopias on stage bring with them a nightmarish burden of exposition, demanding the swift yet subtle illumination of an entire world. There’s a hint of Philip Ridley to Adams’ set-up – think Mercury Fur – but with none of the menace of the withheld. In Ridley’s plays, surreal landscapes shift indistinctly in the background, never fully revealing their logic. Here, however, detail upon detail about this imagined future world is uncovered, but without the accumulating information ever quite forming a consistent fictional universe. There are still dangling loose ends and big, yawning gaps. The tone, too, fails to cohere. It feels like a Sunday-night sitcom dropped into a Philip Ridley fantasy dropped into a political dystopia, with all the disconnect such a combination implies. Lisa Cagnacci’s production is also something of a hodgepodge, struggling to get a grip on the slippery world that Adams has written. Max Dorey’s suitably time-(and water-)stained design neatly separates inside and outside, but the transitions between these two spaces are invariably clunky, while absolutely nothing is added by Max Pappenheim’s future-meets-videogame soundtrack or by the sparse and superfluous use of video projection. If this is what the future looks like, it’s a mess – though perhaps not in the way Adams intended. The real problem with Animals, though, is that it’s a play about capitalism that wants to simultaneously be a play about ageing. Trying to do both, it succeeds at neither. Cheering as it is to see such meaty roles being written for older women – something Adams has been rightly vocal about – this intention finds itself tussling with the play’s conceit. We get fascinating glimpses of a society in which relationships have become coolly detached transactions and language is being steadily corporatised, but the sharp edges of this satire are blunted by the largely unchallenged and all too familiar tropes of old age. There’s plenty to be said here – about austerity, about capitalist logic, about the way society sees older women. But in trying to say too much of it, Animals ties its tongue in knots. What if you could become somebody else? As part of Battersea Arts Centre’s Scratch Online programme, artist Deborah Pearson is currently working on a digital project called Another You, which asks just that question. For one participant, the artwork offers a glimpse into an alternate life; a digital collage of paths not taken and things that might have been. WINK explores a similar possibility. Phoebe Eclair-Powell’s debut play incorporates two generations of digital natives: the twenty-something teacher, who measures his life through his Facebook profile, and the teenage student whose after-school existence is lived almost entirely online. John is already discontented and nostalgic, indulging in a miserable affair and clicking through photographs from his university days. 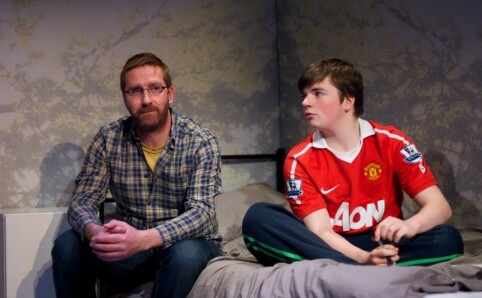 Mark just wants to get away, away from school and family and the grief that seeps poisonously through his home life. These two characters’ lives, connected only in the most superficial of ways, come crashing together online. Jealous of what he believes to be his teacher’s perfect lifestyle – job, girlfriend, holidays – Mark invents a toned and loaded Facebook alter-ego: the brilliantly (and perhaps knowingly) named Tim Walker, lover of cat memes, Banksy and The Inbetweeners. Believing the fabricated Tim to be everything he isn’t, John accepts him as a friend on his girlfriend’s Facebook account and proceeds to pose as the woman Mark fantasises about. Without knowing it, both men are talking to lies. Eclair-Powell and director Jamie Jackson have John and Mark tell their stories directly to the audience, only occasionally acknowledging one another’s presence on the small stage. 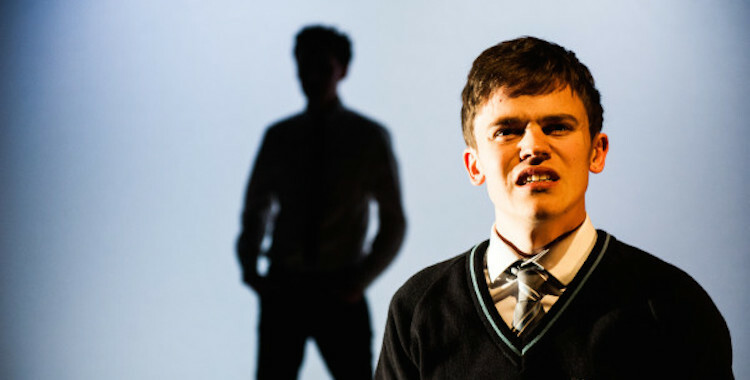 Each is alienated from the other and from the outside world, to a dangerous and unpleasant degree in the case of Leon Williams’ laddish and frequently unlikeable John, while the disconnection of Sam Clemmett’s Mark has a lonely, mournful edge. For both of them, the online world is becoming more real than its physical counterpart. Their desire for intimacy is palpable but frustrated. As ever, the internet proves difficult to represent on stage. Plenty have tried to engage theatrically with this shaping force of 21st-century life, but too often these attempts are strained and quickly dated, while those that do succeed tend to eschew technology altogether and rely on theatre’s analogue qualities – think Chris Goode’s Hippo World Guest Book. Jackson’s production turns to choreography, recruiting movement director Isla Jackson-Ritchie to conjure an abstract virtual environment with just the bodies of the two performers. Inside Bethany Wells’ sleek, white, Apple-esque design, Williams and Clemmett twist and turn, arms swiping through an online cornucopia of content. At times, this device is striking. In a moment of online confrontation, each character concealed inside an internet alias, the choreography pulses with aggression; later, as Mark encounters the internet’s uglier side, Clemmett reels from imaginary punches, the online world delivering invisible body blows. More often, though, the movement feels separate from the rest of the production, tacked on rather than integral. There’s occasionally a similar feeling of effort in the text’s allusions to the online world, as though Eclair-Powell were racking up points for each social network or internet craze given a fleeting mention – Twitter, Facebook, Instagram, Tinder, Snapchat. In the end, it’s all just a little too contrived, neglecting both character and plausibility in order to make its points. The play’s climax, instead of providing the high drama it’s so clearly aiming at, feels overblown and unlikely. In trying so hard to be about the internet, WINK – like John and Mark – loses its way in the online labyrinth. 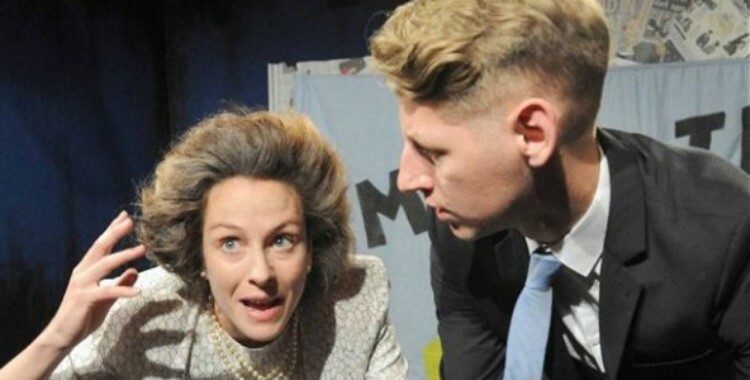 As with its last attempt to address current affairs (emphasis on the current) in Hacked, Theatre503’s night of plays inspired by the legacy of Margaret Thatcher is both aided and hampered by its immediacy. These short pieces aren’t quite dancing on the grave of the Iron Lady, but her death and the potent set of feelings it brought to the surface remain fresh in the collective memory. This adds a certain charge to this range of theatrical responses, which often exploit the rawness of the issues they grapple with, but equally invites some rushed thinking. Arguments made overnight are often flawed ones. The result, somewhat unsurprisingly, is a spirited but uneven night of political theatre. Despite setting their sights on a wide spectrum of issues thrown up by Thatcher’s death, few of these pieces achieve the same punch as Tim Etchells’ 55 Funerals, an immediate but searing deployment of political anger. The tone here is more often questioning, ironic or pointedly shrewd. The evening opens in the crowded theatre foyer with Brian Walter’s Apples, a sharp three-part breakdown of neoliberalism that neatly nods to Thatcher’s greengrocer father and threads through the evening as an important if simplified reminder of the mark left on the UK economy by her government. It might lack a little in complexity, but its message remains depressingly relevant. It also offers some great work from Paul Cawley, Rachel De-lahay and James Cooney, including an unlikely but storming version of Will Smith’s ‘Summertime’ courtesy of De-lahay and Cooney. Also in three parts, lending some structure to what might otherwise be an amorphous bunch of responses, is Kay Adshead’s I Am Sad You Are Dead Mrs T. This takes the form of a trio of eulogies to Thatcher, one from a bigoted ‘yoof’, one from a vile Tory-in-training and one from a resident of the underprivileged communities so neglected by Thatcher’s government. The first two monologues are packed with satirical barbs and the kind of “scroungers” rhetoric still nurtured by the current government, at times coming dangerously close to perpetuating the same stereotypes they seek to skewer, but it’s in the third that Adshead really brings out the fists. This final, deeply moving piece lands a devastating blow to the guts, leaving us in no doubt about just who has suffered and continues to suffer under Thatcher’s grim legacy. Elsewhere, the responses are decidedly mixed. Dominic Cavendish’s dream-likeTrue Blue strands an unusually sympathetic Maggie on a desert island, clutching onto the departing tide of her deteriorating mind. It’s Thatcher’s individualism pushed to its isolated extreme, as the ultimate survivor finds herself completely alone, cast off from the society she insisted did not exist. Jimmy Osborne’s tight domestic focus on one couple turns the lens on the Falkland Islands, while My Dinnertimes With Clarence by Fraser Grace tackles education and supposed equality of opportunity through the tender friendship between a teacher and student. And never has the bonus culture of banking looked more repulsive than in Ben Worth’s testosterone-drenched Shirt and Tie, following two competitive city boys on a booze and cocaine-fuelled night out. It’s canny programming to conclude this mixed bag of offerings with an absolute gem from Jon Brittain and Matthew Tedford. Margaret Thatcher Queen of Soho, led by a brilliant performance from Tedford dragged up in full wig and pearls, imagines a wrong turn in the 1980s leading to a glittering cabaret career and a brilliantly camp reconciliation with the gay community for a lady who suddenly is for turning. This is deliciously arch fun, cloaking its fangs in sequins and hotpants. And there should be some kind of prize for the line “where there are discos, may we bring harmonies”. The overall impact of these collected responses, however, is uncertain. A question that often haunts fictional responses to recent events is the repeated chorus of “how soon is too soon?” In the case of a divisive public figure such as Thatcher, political legacy has to be available for discussion, but the question instead shifts to the quality of that debate. Immediacy is all very well, but there’s the risk that speaking too soon produces statements that aren’t worth hearing. With a few incisive and provocative offerings, Theatre503 just about escapes that fate, but its impetus is worth pausing over. Is this simply a calculated attempt at topicality, or do these statements carry weight beyond the immediate aftermath of the event? Perhaps, even if most of these offerings will rapidly fade away, they have established a lively theatrical debate around a figure who continues to hold huge significance for politics today. In any case, it’s unlikely that theatre is done with the Iron Lady just yet. Doing good is a habit. So is doing evil. This is the lesson of the Iraqi schoolroom, where the unnamed narrator of Douglas Rintoul’s monologue for Transport Theatre witnesses a schoolmate being taught out of the habit of left-handedness. In this world, anything but conformity to the norm must be stamped out. Based on recent real-life accounts of homophobic violence in Iraq, ‘Elegy’ attempts to return a voice to these others through the power of storytelling, acknowledging as it does the unreliability of narrative. The storyteller, a gay man in a nation where ‘liberation’ has only increased prejudice, delivers his tale in the third person. His narrative does not assume to speak for anyone in particular, and yet he speaks for everyone. A knowingly incomplete tale of persecution and exile, ‘Elegy’ has been pieced together using various sources drawn from post-liberation Iraq. This patchwork process is reflected in the form, as Sam Phillips’ anguished speaker flits between memories that flicker like the fluorescent strip light hovering above him. 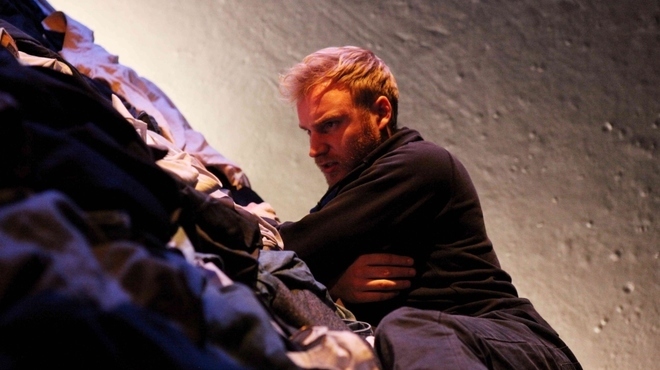 The mound of discarded clothing in Hayley Grindle’s set has an archaeological quality, suggesting remnants of other refugees or victims of brutal murders, left behind or taken from them. As an exposure of the horrors of homophobic killing and the dislocation of forced migration, ‘Elegy’ can only ever capture a limited snapshot. But it is a vivid one. The piece departs, aptly, still trapped in a refugee limbo – between nations, between memories, between fact and fiction.